ISLE Surf and SUP has a reputation for delivering competitive watersport equipment that takes customers on water adventures all over the world. For that reason, we have grand expectations for their classic soft top SUP board, and it appears the board has delivered. Here?s what we think about Isle?s classic SUP package and how it performs. Isle doesn?t shy away from bright color schemes or alternatives to bland tones, and this board?s blue rail design makes an eye-catching first impression. The top deck offers comfortable cushioning in the form of polyethylene, while the material underneath is durable and slick. Isle cautions riders against going beyond flatwater and small waves, so the board calls to most beginners and intermediate level paddle boarders who may feel nervous on the water. Its high-density construction and EPS core give stability without adding bulk. Here?s how the Isle?s SUP specs stack up. Overall, there?s plenty to love about this versatile board that suits everyone from beginners to advanced paddle boarders. Here are our favorite things about the Isle SUP. The high weight limit means nearly anyone can use this board, and Isle notes that experienced riders can exceed the specified weight. In short, it?s a versatile board for larger adults, families, and couples. It also caters to people with larger builds who may be unsuccessful staying balanced on boards with lower weight capacities. Ample traction helps new paddle boarders stay upright and helps instill confidence. Rather than a slippery top deck that scares newcomers, the non-slip surface has a rough feel that helps reduce slippage without being too harsh on bare feet. At 27 pounds, Isle?s 5-inch-thick board is lighter than most epoxy boards and can compete with most inflatables. The foam construction keeps this board surprisingly lightweight given its bulk, so while you may struggle to hang onto it because of its size, the weight won?t sink you into the ground. Even paddle boarders of smaller stature report handling the board easily, so although it?s nearly 11 feet long, it?s not unwieldy. The included paddle is adjustable and extends to a length of 85 inches, accommodating users up to 6 feet 4 inches tall. That?s a considerable height range, so for paddle boarders who prefer not to invest in a paddle until they?ve gotten some experience on their boards, the accompanying paddle will probably suit them. In comparison with other boards of this quality, we?d expect to see a higher price tag on the Isle SUP. However, their boards maintain a reputation for affordability, so its low price point isn?t too big of a surprise. 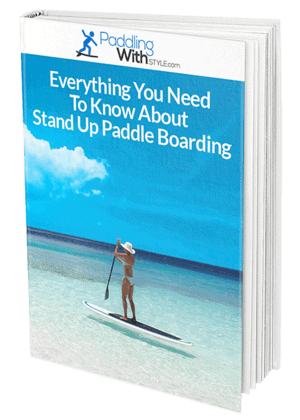 At the same time, this beginner-friendly board can take a paddle boarder from the first trip to advanced paddling with ease, making it cost-effective over the long term. Since no board is entirely perfect, we do have a few complaints about the Isle SUP. Here?s what we don?t like about this board. Since the board?s foam construction allows it to compress slightly under pressure, you may see marks from strapping it down tightly. Even light bumps can create dings in the material, and while it?s mostly a cosmetic concern, we don?t like that the surface is so sensitive as to show every bump and scratch. If you don?t mind purchasing a bag or cover for your SUP, or if it?s not inconvenient to place towels or other materials over it before tying it down, then the minor scuffs won?t pose an issue. If you?re rough on your board, you can expect that this model will begin to show the effects sooner rather than later. The same goes for the decals on the board, since although they look spiffy upon arrival, they may not last long if you?re an avid paddle boarder who?s on the water or transports their board a lot. It?s not alone in having a slimmer profile, but the Isle SUP board can be more challenging to manage than a wider board. This means it?s not entirely suitable for rougher water and may perform better in calm water like lakes and slower rivers. That said, it is still easily maneuverable for most users, even beginners or those unfamiliar with a narrower base. Without clear instructions on how to affix the included fin, some users may feel frustrated before they?ve even gotten onto the board. In general, a removable fin either poses a concern because it can get lost, or it?s a perk since it comes off for storage. Either way, we would prefer a straightforward direction on keeping it on when we want it there. While the Isle SUP comes with an adjustable paddle, the removable fin, and a center handle for portability, we would like to see additional accessories that enhance the experience. An ankle strap, for example, would make sense, given that the board caters to beginners and families with its lightweight and forgiving construction. Although the initial investment may seem steep when considering Isle?s SUP for a beginner, the fact that it?s long enough with a high enough weight limit to accommodate everyone in the family makes it worth the cost. Despite its size, it?s easy for people of smaller stature, as well as children, to handle, so it?s genuinely a family-friendly board. However, even advanced riders won?t want to go beyond the recommended flatwater and small waves, as Isle suggests. This means adventurous paddle boarders may want to look elsewhere for a board that can handle rough and unpredictable water. For casual paddle boarding for beginners to intermediate level boarders on calm water, you can?t go wrong with Isle?s soft top SUP package. 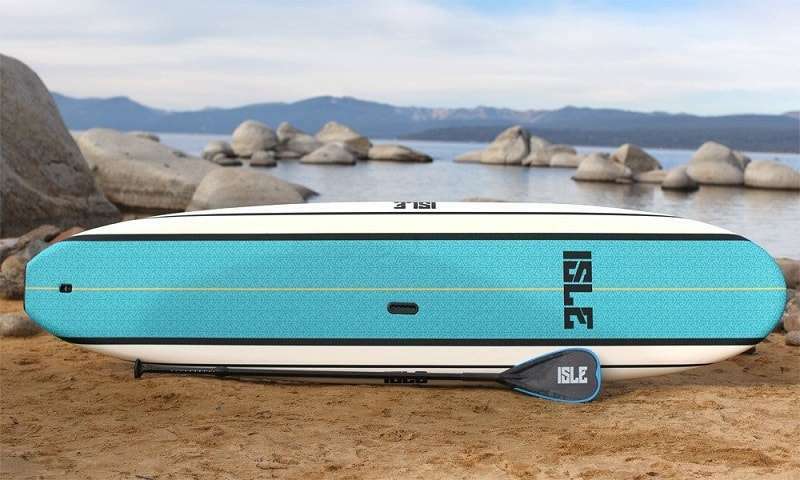 Once you get past the initial sticker shock, you?ll see a board that offers plenty of value for its price tag and caters to families full of paddle boarding enthusiasts.